Angelo here from Ritchey Design. I stumbled upon this post and it appears that the bolt could possibly be over-tightened (beyond 5Nm). 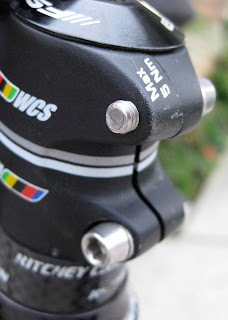 Please drop me an email at rd_info_line@ritcheylogic.com (Attn: Angelo), as I'd love to get more info/detail from you. message sent, I used a Ritchey Torque Key to tighten all hardware. Thanks! Of course, I've got house brand components to fall on...erm...fall back on.